Glenn Irwin will have his final ride on the PBM Be Wiser Ducati this weekend at Brands Hatch before switching to the JG Speedfit Kawasaki team for 2019. Glenn Irwin admits it will be an emotional weekend as the Carrick man prepares to have his final race on the PBM Be Wiser Ducati at Brands Hatch after three years with the team. Irwin will leave Paul Bird’s outfit to join JG Speedfit Kawasaki in the 2019 Bennetts British Superbike Championship, taking over the reins from champion-elect Leon Haslam, who will team up with World Superbike champion Jonathan Rea at Kawasaki. British Superbike rookie Andrew Irwin will also leave the PBM Be Wiser Ducati team after Brands Hatch following confirmation that Scott Redding and Josh Brookes will ride the new Ducati V4 for Paul Bird's team in 2019. Irwin made the Showdown for the first time this season and the 28-year-old can clinch third position overall at the triple-header finale, which commences with free practice at the Grand Prix circuit on Friday. The Ulster rider, who won both Superbike races on the PBM Ducati at the North West 200 in May, is also eager to claim his first victory of the season. 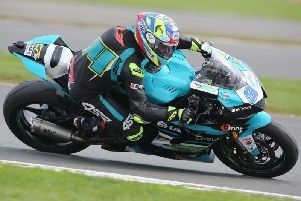 Irwin went close at brands Hatch in July, twice finishing as the runner-up behind Josh Brookes, and he is fired up to make it onto the top step this weekend. “I’ve got mixed emotions heading into the final round on what will be my final BSB round for PBM for the foreseeable future,” said. “The goal never changes and that’s to win races and I think that it would be fitting to end my time at Be Wiser Ducati in this way. Obviously third position in the title race is realistic now as well, which would cap a successful season in which the Showdown was the objective. Following the announcement on Wednesday that Aussie Brookes would join MotoGP rider Scott Redding in a new-look line-up for Bird next season, Andrew Irwin will also be having his final outing for the team on the Panigale at Brands. Irwin was brought in to replace the injured Shane Byrne – whose ultra-successful stint with PBM is also at an end – and the 24-year-old has impressed in his rookie season in BSB. The young prospect, who has been linked with several teams for next season – including Tyco BMW – said: “I go to Brands Hatch with a good feeling after Assen where I feel we found something extra in the second race.